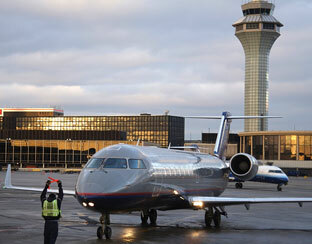 Chicago O'hare International Airport and Chicago Midway Airport serve Chicagoland, and are illinois's leading airports. Other major Illinois airports include the Abraham Lincoln Capital Airport in Springfield, the Central Illinois Regional Airport in Bloomington, the Champaign Willard Airport, the Decatur Airport, the Greater Rockford Airport, the Peoria Regional Airport, the Quad City International Airport in Moline, and the Veterans Airport in Marion. The photo at right shows a jet aircraft arriving at O'hare International Airport. This Illinois airport map shows FAA-designated commercial service airports, reliever airports, and general aviation airports in the State of Illinois. Primary airports are designated with an airplane symbol. Illinois airport map source: FAA 2001-2005 NPIAS.